Pancake is helping over 6000 companies save money and bill more time each month! Pancake is putting money back into it! In less than 8 minutes you can permanently have control over your business's core tools. If you already have a website you likely have everything you need to get up and running in just a few minutes. If you're not comfortable with the thought of installing this yourself that's not a problem. We'll install Pancake for you, free of charge! Do you want to have control of the tools your business relies on everyday? When you buy Pancake you get all the tools your business needs, in their entirety to install on your server, in your control to use forever with no monthly fees. You pay once and use it forever. You have enough to worry about with your own business, do you want to worry about the state of other businesses? Is keeping track of billable hours important to your business? Tracking hours on tasks is an important part of any business's bottom line. In fact, poor time tracking can easily sink your business. Pancake makes it very easy for you and your team to ensure all billable hours are accounted and billed for. 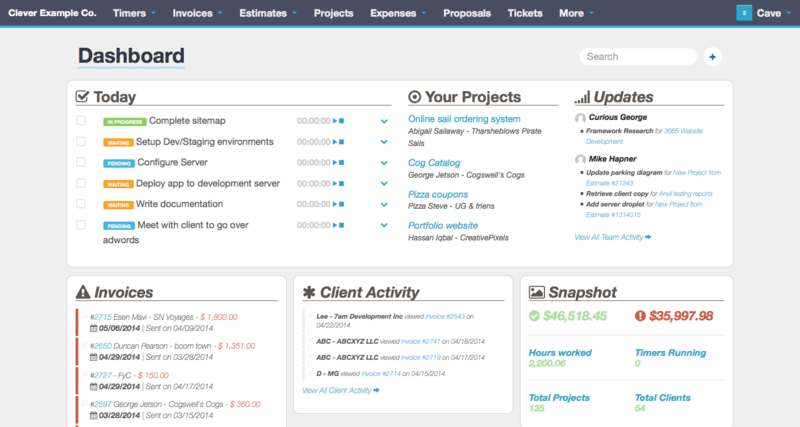 With amazing time tracking, Pancake will ensure that every billable hour on a project gets invoiced for. No more missed hours, no more lost revenue. Invoicing is the most fun you'll have all week! Normally you'd scoff at a statement like that, however we've made it incredibly easy to invoice your clients and more importantly, we've made it very easy for your clients to pay you. With one click generation of Invoices, Pancake's stellar time tracking and a wide array of payment methods you'll be sending invoices in minutes and getting paid shortly after as they can pay it immediately online. We've also thought about those clients who, ahem, like to drag their feet and included tools to help you deal with slow paying clients. You can see when a client last saw the invoice, so there will be no more excuses of not receiving it. Pancake also lets you send reminders to all slow-to-pay clients in one go. Would you like to grow without limits? We don't think it's very awesome to punish people for growth and sadly that's the business model of so many services. Let's take a look at how Pancake compares to other monthly services. Landed a new Client? +$$ /month Included! Hired a new employee? +$$ /month Included! Create a new invoice? +$$ /month Included! Add a new project? +$$/ month Included! Collect payment online? +$$ /month Included! You pay once for Pancake and that's it. You never have to pay another cent to run your business. No Fees, No limits. Liberating isn't it? Would you want your invoices to match your brand? I'm not talking about just adding your logo to the top of the invoice and calling it done, I'm talking about matching the visuals of the client facing aspects of your business to match your brand. 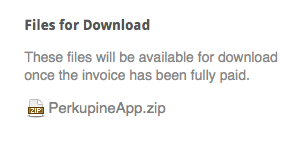 Pancake gives you total control over the appearance of invoices, proposals, emails etc without constraint. It's ridiculously easy and you don't have to worry about us slapping our name all over your invoices, we're not that kind of software. Being that Pancake is installed on your server, your client will think this is something that is yours. You're not sending them to our domain. They're going to your domain and seeing your brand. All the tools you need to run your business and a foundation to build upon. Pancake looks after your projects from proposal to payment. 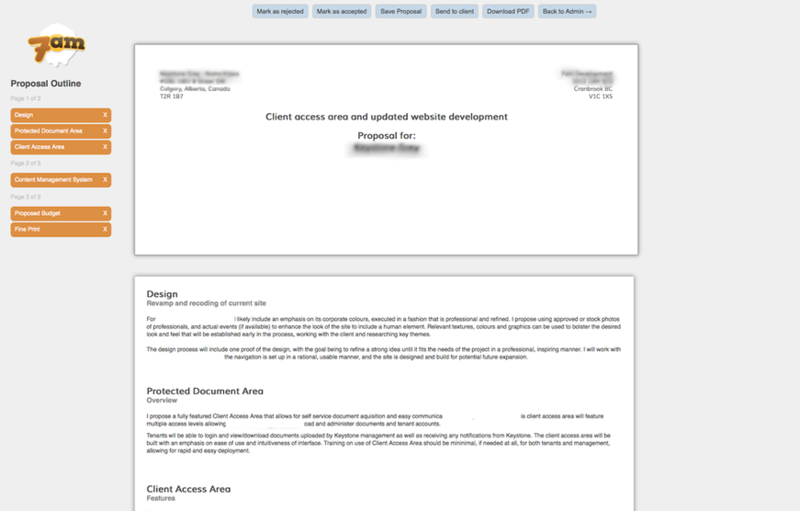 Pancake has a clever and elegant proposal creation system that allows you to quickly create multi-page proposals using reusable sections to win you new work. Easily create estimates from reusable line items, send them to your client and when they accept it a new project will be created for you. 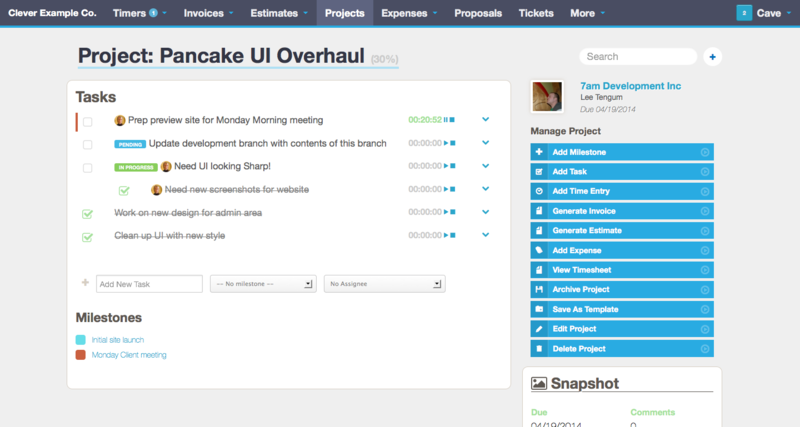 Project management shouldn't be complicated and with Pancake you'll stay on top of your business and budget! Tasks are the little cogs that keep projects on track and for that reason Pancake takes tasks very seriously. 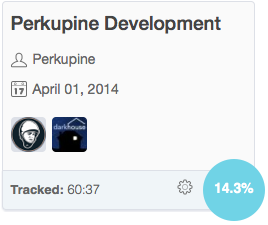 Easily create tasks, assign due dates and Pancake will make sure that you hit your deadlines. With Pancake's built in timers, and easy to use mobile time tracking app, Pancake makes it easy to start your timer. Surprise phone call? Start a timer! Onsite meeting with clients? Start a timer. Time Sheets you will love to use! Pancake doesn't just create timesheets that make it easy to calculate payroll, Pancake gives you a snapshot on where you spent the most time. Know your budgets, know your business. 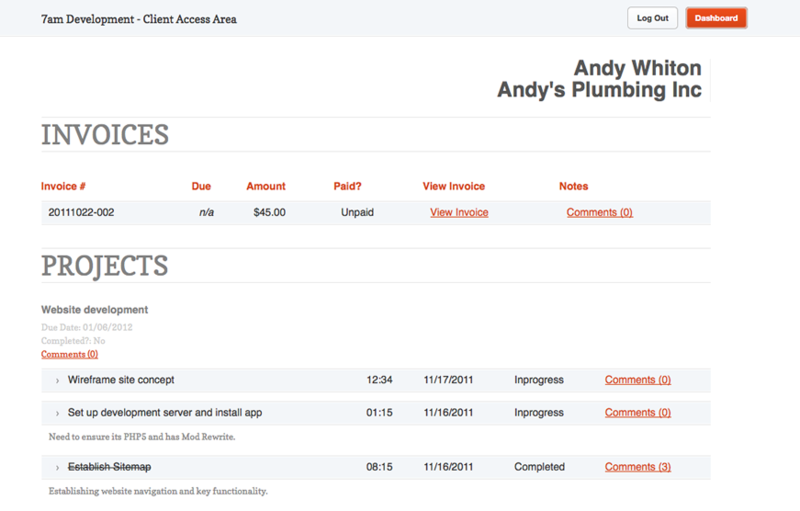 Keep track of all your invoices, send urls to your client and receive payments online. Get paid in minutes! 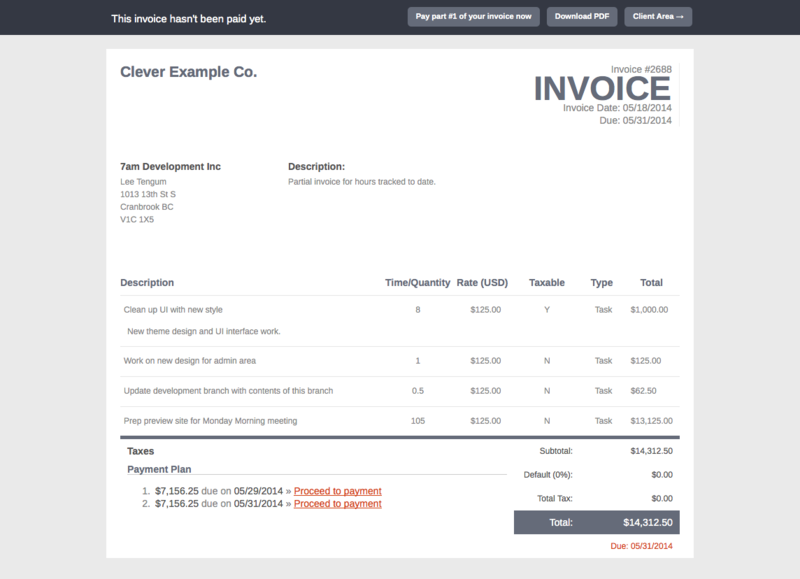 You can create, with one click, an invoice based on all the tracked time. Choose which items you want to include and Pancake will make sure those hours are accounted for. Never lose a billable hour again! You can even choose to create a payment schedule to help clients pay over a period of time. Now that you've created the invoice for your client you can send them a simple url to the invoice on your site and they can pay immediately using the method of your choosing. Be that Stripe.com, PayPal, Authorize.net and more! 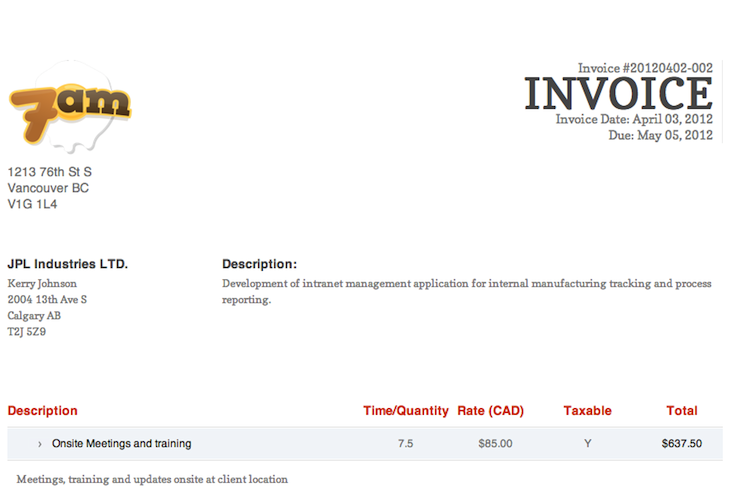 Best of all, when your client needs copies of their invoices they can login and retrieve them on their own. Pancake is really easy to install, however we get that may be daunting to some and we're pleased to offer free installation! Simply let us know after you purchased and we'll get cracking on installing it for you on your server. The best part is Pancake autoupdates, so once it's installed it will keep itself up to date! We know you're going to love it and we'll make sure you get up and running! We could wax poetic about Pancake all day long, we truly love it, and we're excited about what it could do for your business! 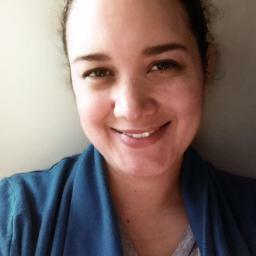 Pancake makes it really easy for me to quickly create estimates, and then to get them out as invoices (and get paid online) with a minimum of fuss and effort. Invoicing is one of my least favorite business tasks and I barely have to think about it anymore! Since I've been freelancing I've been on the hunt for a great invoicing application that I could self-host and use easily. I've tried everything out there from the free to the paid and they either didn't have enough functionality or were too bloated with their features. I finally came across Pancake and I have to say it's one of the easiest and most intuitive applications I've ever used. 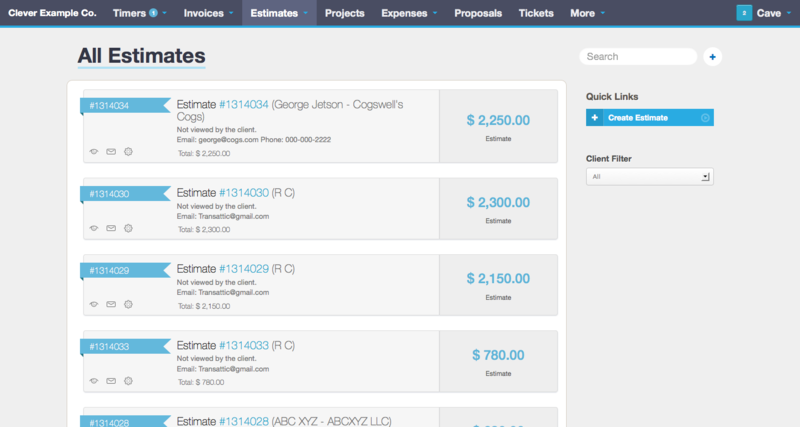 You can track your tasks, set milestones, generate estimates and invoices, and all in one application. Everything is customizable! Every freelancer has a secret weapon to help streamline their projects. Pancake is mine. 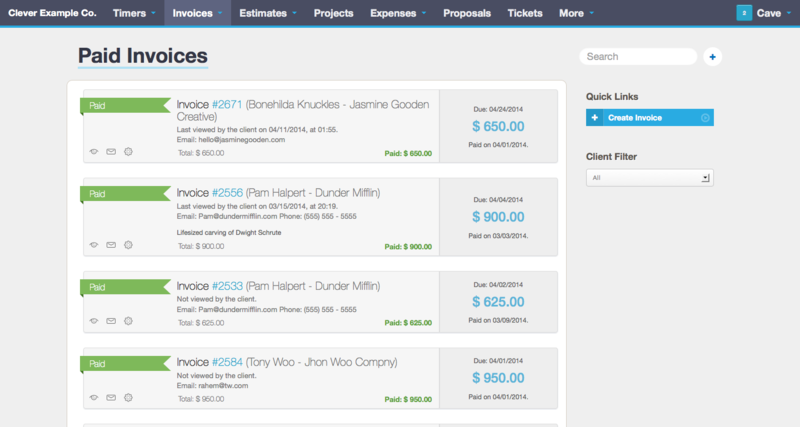 Invoice clients with ease and get back to doing something awesome! Quickly convert tracked time and completed tasks into invoices with one click. 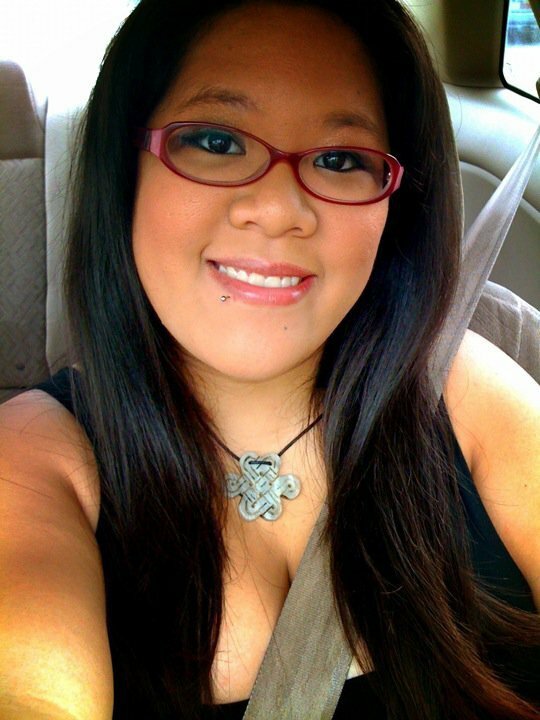 Pancake makes it simple and easy to get paid fast! Get paid online using Stripe, PayPal and Authorize.net right out of the box! Generally Project Management is probably the least interesting part of your day, but Pancake does a great job of making it quick and easy. You won't stress over complex systems, just simple milestones, tasks and time tracking, which can be turned into invoices with one click! 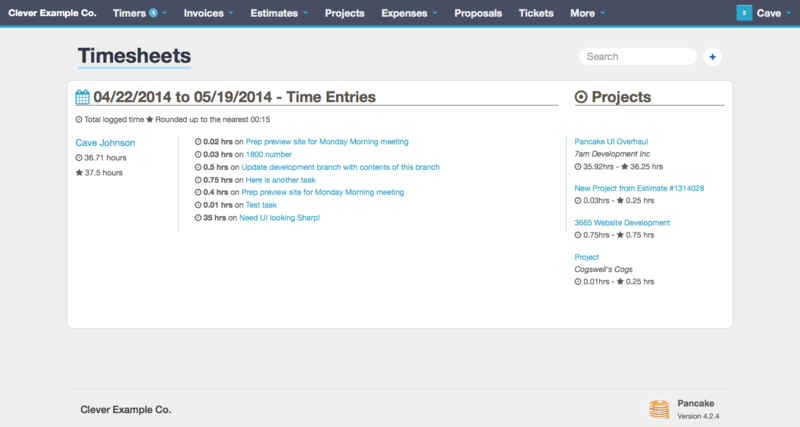 Quickly make tasks and sub tasks, start the timers and never miss a billable hour again! Pancake makes sure that every tracked hour is accounted for. Easily create processes for your projects so tasks are not forgotten and mistakes are eliminated. Stop all of that and use Pancake's crazy-simple timer, built right in! Clients can be crazy and needy, we get that! Through a simple interface you can interact with your clients, show progress and hours logged on tasks, share files for approval, brainstorm ideas as well as allow them to view all their invoices and proposals. Pancake makes CRM easy! Buy now! Pay once, use forever!